With the humidity we've been having, rain is a welcome change. I'm honestly hoping for more daytime rain, as our last two storms were at night. But even with the storms and intermittent humidity, crochet has taken place! My Hexy now has two skeins worth of Cotlin into it, and I have a third still in my stash, with several more on the way to finish up. Not the perfect stashdown project, but stash is still moving from yarn to WIP to FO. To keep my 'theme' of project polygamy, I did start another project last night. I'm testing a baby sweater pattern for MAD Cap Designs, and so far so good. My husband made a comment about the last sweater I made-- it was a knitted vest for my brother and took 3 years to make- and I scoffed, saying that crochet plus baby equals a faster project. I really hope I'm right this time :) I was only able to get the bottom ribbing band done at craft night last night, but I am hopeful that spending some time with my DVDs will make the progress go faster. Nothing really in exciting colors yet. Sometimes its uncanny how my colors match my mood and/or the weather. And my dear Michigan cannot decide if it wants rain or sunshine. Early early this morning when I took my husband to work, it looked like more rain. As the day goes on, it's starting to look like sunshine again. So much "wait and see" with the weather. I will have 4 totally new to me classes next school year, while also being on maternity leave at the beginning of the year. Not sure if this situation is better or worse then last year's, where I had less than two weeks to plan for 2 classes-- plus a wedding. Oh well, the world of teaching is always exciting. Linking up with Tami & Ginny. So lovely! How do you like the CotLin? 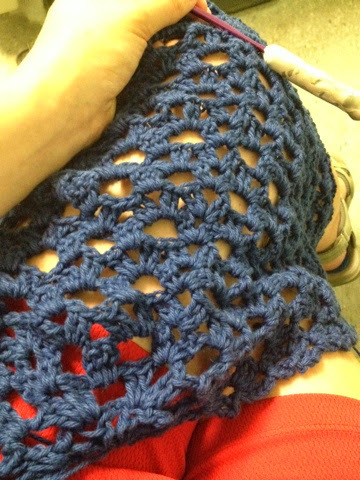 My WIP is a crocheted shawl too! "Project polygamy," ha ha ... when it comes to projects, I'm a downright floozy! I only have three now, which is odd for me. I like the blue throw, very summery color!